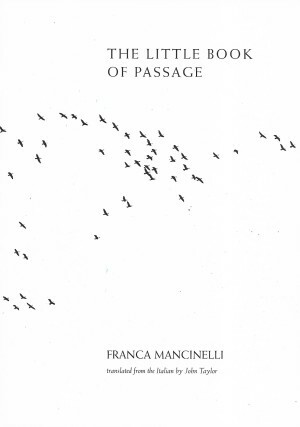 Italian poet Franca Mancinelli’s The Little Book of Passage, with facing-page translation by John Taylor, exemplifies the best possibilities of the prose-poem form. As James Longenbach notes in his excellent book The Art of the Poetic Line, prose poems invoke our expectations of prose to be logical and univocal, but the form subverts those expectations with the mystery and multivalence of poetry, a kind of guerilla incursion against rationalism. Mancinelli makes excellent use of this legacy, rooted in Baudelaire and the symbolists, to create a captivating account of consciousness moving back and forth across the borders of the self. A primary image to suggest this motion of consciousness is transit, especially rail travel. She writes, “In this landscape I can close my eyes and sleep, without feeling remorse about interrupting the train’s storytelling: how one lives, how the trees and houses are arranged, what human beings are doing,” and it seems there is indeed no need for remorse, as the “storytelling” moves easily across the boundaries between the self and the outside world. The uninterrupted flow of the prose-poem form becomes a stream of consciousness that blurs the distinction between interior and exterior perception, as if the world that moves by outside the train window continues to move in her mind when the poet closes her eyes. Speaking of stream of consciousness, another important metaphor for mind in this book is water. Mancinelli uses water to suggest both the depth and fluidity of consciousness. “Here’s the river which widens my gaze, which flows through my forehead,” she writes in one poem. In another she writes, “I’d like to gather you up in my hands, take you in . . . while you are born, but you gush forth: you are the primal current that cannot be touched.” She seems here, as in many of the poems, to be addressing herself in the second person. Throughout the book, images of water and of motion suggest a decentering of selfhood, a fluid consciousness. If these poems sometimes fall into the trap of a too-easy surrealism, they more than make up for it in their vivid imagery and engaging union of form and content. 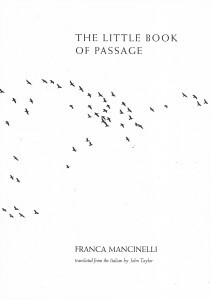 Mancinelli writes movingly of loss and its effect on one’s sense of self. That each poem is brief but engrossing and that the book itself is attractive and compact make The Little Book of Passage an ideal traveling companion.